Winter Weather Update: Are you Ready For Snow? There’s snow and more cold weather in the forecast. This weather pattern is setting up similarly to what the islands last saw in 2008: extended cold, possibility of multiple snow events, and intermittent high winds. 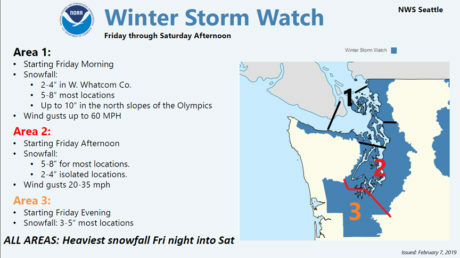 This is just a forecast, so we might end up with no snow, we might end with more snow, and there will likely be a wide range of impacts across the San Juans. In 2008, some islanders ended up needing stay at home for a number of days due to impassable roads. We also had challenges with pipes that froze during power outages in unoccupied homes, causing considerable water damage with the eventual thaw.